Every time I try out a new shampoo, I feel wary. No matter how great they sound, the run the risk of giving me a truly terrible hair day. Not so with the new Kiehl's Sunflower Color Preserving Shampoo and Color Preserving Conditioner. No, these two miracle-workers have done everything right since they came into my life. Now, this shampoo and conditioner are formulated to protect color-treated hair, which mine is not. But I figured it couldn't hurt to act like it's been colored, so that it still reaps all the benefits. They're sulfate-free, silicone-free and paraben-free, so they really work to make your hair look unbelievable with as few bad ingredients as you could imagine. Plus, they're rich in antioxidants to repair damage caused by chemical processing (for those gals out there who need it!). They even use gentle surfectants to cleanse without stripping the color away. Both are created with sunflower oil, which includes high levels of Vitamin E and essential fatty acids. They also contain apricot oil, which has a Vitamin-rich blend of B3, B5 and B6; and a UV-protective filter so harmful rays don't weaken and destroy your strands. And OH MY GOODNESS, they smell unbelievable. Seriously, I don't think I've ever used a shampoo and conditioner that smell this good. They're sweet, rich and completely delicious. If I could, I'd drink them. Every time I put them in my hair, I find my showers taking longer and longer so I can inhale the scent for as long as humanly possible! The first time they made my hair look amazing, I thought it must be a fluke. A one-time event that couldn't possibly be repeated. But then I washed and conditioned my hair with them again ... and again ... and again. And each time, my hair was shiny, bouncy, vibrant and full of life. So now these are my two miracle workers ... AKA the two products I hide when guests come to stay, of course! 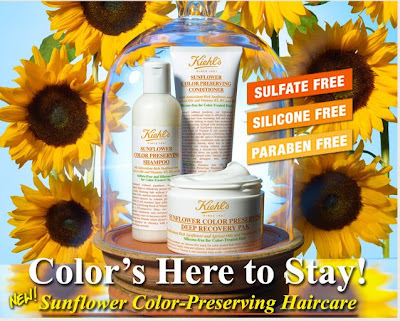 Kiehl's Sunflower Color Preserving Shampoo retails for $18.50. Kiehl's Sunflower Preserving Conditioner retails for $19. You can find both at kiehls.com. I am a die hard Kiehl's fan! I love their amino acid shampoo. I don't have colored hair but if I did I would definitely try this duo! Thanks.